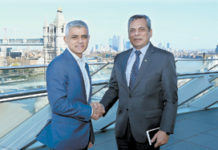 LONDON: The best of Muslim culture celebrated at the Mayor’s annual festival The Mayor of London, Sadiq Khan, will today join with Londoners from all backgrounds, faiths and communities for the annual Eid Festival celebration. The 13th Eid Festival on Trafalgar Square will once again unite Londoners and visitors to the capital to celebrate the end of Ramadan. This year’s event will celebrate London’s diverse Muslim communities through displays of Muslim art, cultural exhibits, poetry, story-telling and food. As part of the Mayor’s #BehindEveryGreatCity campaign, the vital contribution of women to Muslim culture will be a focus of the festival, with speeches and presentations from an exciting line-up of Muslim women and girls including performances from Maya Youssef’s Ornina Ensemble and the Al-Sadiq AlZahra School Choir. The international programme, hosted by Sameena Ali-Khan and Remona Aly, has been designed for all ages with Danish-Palestinian Darbuka drummer Simona Abdallah and British-Eritrean rapper and social commentator Awate reflecting the diversity of the Muslim creative community. The Mayor of London, Sadiq Khan said: “Eid al-Fitr is a time for celebration. I’ve thoroughly enjoyed breaking my fast with Londoners of all faiths and backgrounds across our city, and now, after the fasts of Ramadan, I can’t wait to bring together families and neighbours to share our cultural traditions.